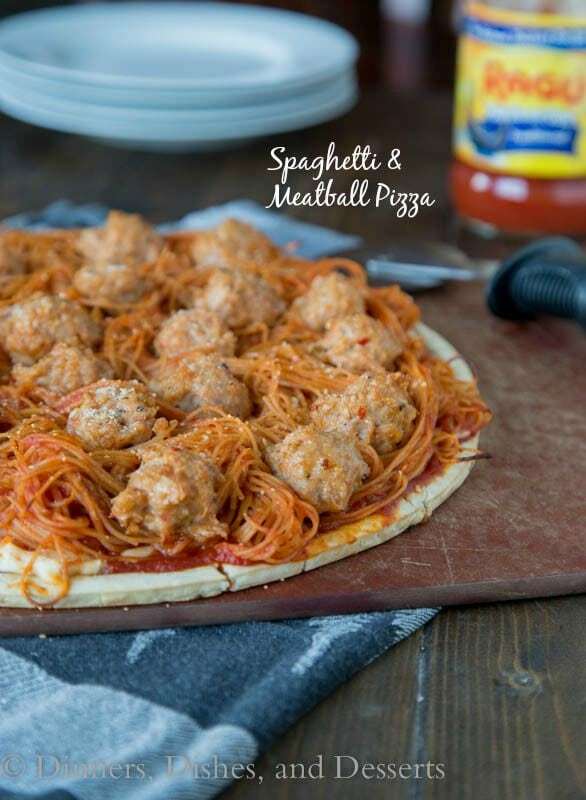 Spaghetti and Meatball Pizza – turn pizza night into something new by topping it with spaghetti and meatballs! 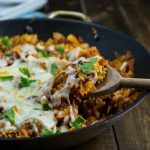 Do you ever get stuck in a rut with dinner? You have tacos one night, spaghetti one night, pizza one night and so on. 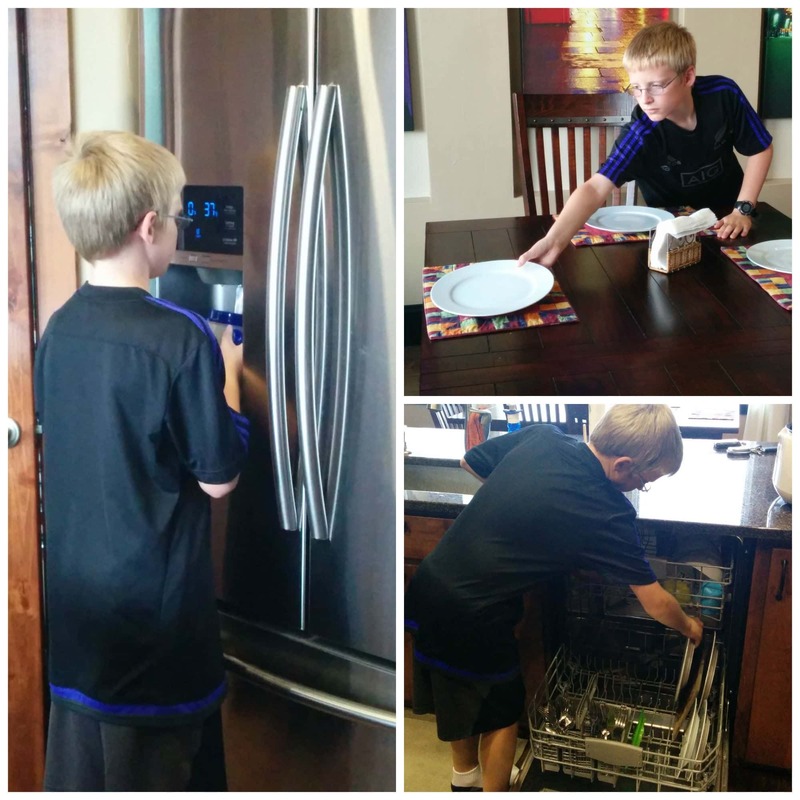 You know what your family will like, you are short on time, and you just keep repeating the same things week after week. Well, it is time to switch things up! 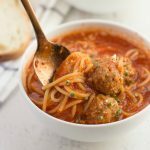 I was inspired by Ragú® to put an awesome twist on their classic spaghetti and meatballs recipe by turning it into a pizza! Definitely a #saucesome twist the whole family is going to go crazy for! 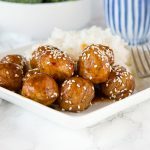 What is Saucesome? 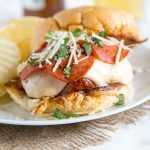 Saucesome is like mealtime magic! Dinner at my house, even on a weeknight, is an important part of the day. No matter what is going on, we do our best to all have dinner together. My son is in charge of getting the table set, getting drinks for everyone and helping out with whatever he can. It is a time where we can all come together, relax, and chat about our days. My son will tell stories about what happened at school, and is always full of questions about our day. 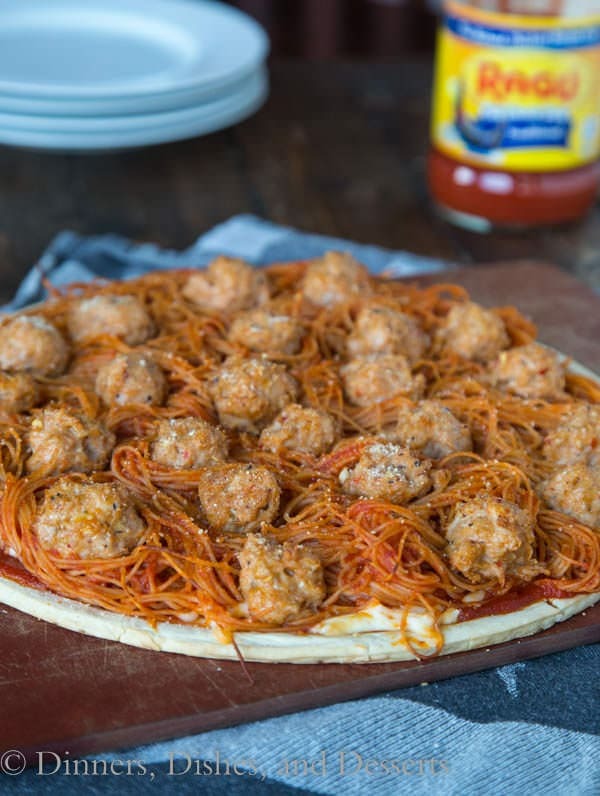 So when I told them we were making a pizza that had our favorite spaghetti and meatballs on it, they thought I was crazy. But I got them involved, and by the end they were believers. With all of us working together, we were eating in no time! 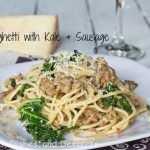 My husband said it was kind of like having spaghetti and meatballs and your bread sticks all together. For this pizza, you can use your favorite homemade pizza crust or store bought crust. 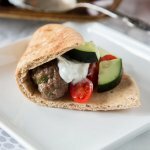 I used Italian sausage for the base of my meatballs, so they had tons of flavor and were a little closer to a classic pizza topping. 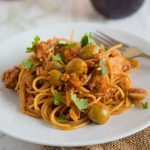 The spaghetti is tossed with Ragú® Old World Style® Traditional Sauce and then I used the same sauce to spread on the crust. A little secret I have learned with making homemade pizza is to bake the crust for a few minutes before putting on any toppings. It gets a little crispier that way. 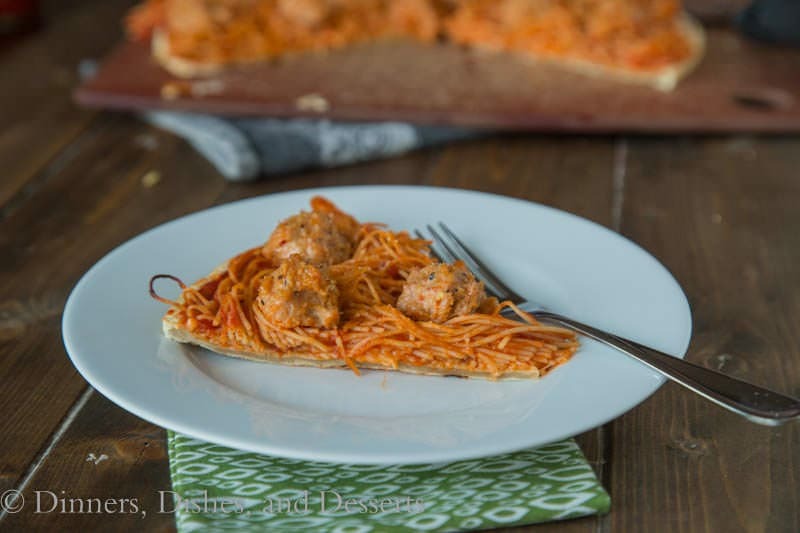 Spaghetti & Meatball pizza is definitely a great weeknight meal that will get your family wanting to come to the table. 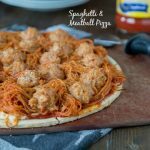 Spaghetti and Meatball Pizza - turn pizza night into something new by topping it with spaghetti and meatballs! In a bowl combine sausage and bread crumbs. 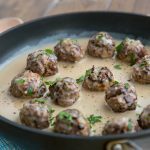 Form into small balls, and place on a baking sheet. Bake for 6-10 minutes, until cooked through. Spread pizza crust onto baking sheet. Bake for 4 minutes. 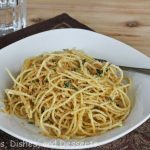 Mix together spaghetti with 1 cup of Ragú sauce. Remove crust from oven. Evenly spread with 1/2 cup Ragú sauce. Sprinkle with cheese. Spread the spaghetti evenly over the cheese. Sprinkle with Parmesan cheese. 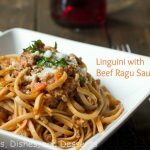 Be sure to check out Ragú® on Facebook, Pinterest, and Twitter to find other Saucesome recipes the whole family will love. And don’t forget to visit www.ragusweeps.com for a chance to win a variety of #Saucesome prizes! 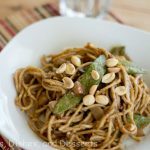 This is a sponsored conversation written by me on behalf of Ragú. The opinions and text are all mine. Ragú is celebrating everything that makes family mealtime #Saucesome. From unique recipes to silly moments to crazy weeknights…we want to hear it all. Do you have a recent #Saucesome moment or recipe? Share below! Now that’s a pizza my kids would go gaga for! Oh, boy! 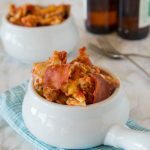 Two of my favorite comfort foods in one! What a terrific meal! I just love Ragu. It’s my go to sauce. This is fabulous, I wish I was noshing on some now.